You can configure your Nextcloud server to automatically run a virus scan on newly-uploaded files with the Antivirus App for Files. The Antivirus App for Files integrates the open source anti-virus engine ClamAV with Nextcloud. ClamAV detects all forms of malware including Trojan horses, viruses, and worms, and it operates on all major file types including Windows, Linux, and Mac files, compressed files, executables, image files, Flash, PDF, and many others. ClamAV’s Freshclam daemon automatically updates its malware signature database at scheduled intervals. ClamAV runs on Linux and any Unix-type operating system, and Microsoft Windows. However, it has only been tested with Nextcloud on Linux, so these instructions are for Linux systems. You must first install ClamAV, and then install and configure the Antivirus App for Files on Nextcloud. As always, the various Linux distributions manage installing and configuring ClamAV in different ways. The installer automatically creates default configuration files and launches the clamd and freshclam daemons. You don’t have to do anything more, though it’s a good idea to review the ClamAV documentation and your settings in /etc/clamav/. Enable verbose logging in both clamd.conf and freshclam.conf until you get any kinks worked out. This installs two configuration files: /etc/freshclam.conf and /etc/clamd.d/scan.conf. You must edit both of these before you can run ClamAV. Both files are well-commented, and man clamd.conf and man freshclam.conf explain all the options. Refer to /etc/passwd and /etc/group when you need to verify the ClamAV user and group. Please avoid any multiples of 10, because those are when the ClamAV servers are hit the hardest for updates. That should take care of everything. Enable verbose logging in scan.conf and freshclam.conf until it is running the way you want. Place the files_antivirus app into the apps directory of your Nextcloud server. Then the app shows up on the Nextcloud Apps page where it simply can be enabled. Next, go to your Nextcloud Admin page and set your Nextcloud logging level to Everything. Now find your Antivirus Configuration panel on your Admin page. Daemon (Socket): ClamAV is running on the same server as Nextcloud. The ClamAV daemon, clamd, runs in the background. When there is no activity clamd places a minimal load on your system. If your users upload large volumes of files you will see high CPU usage. Daemon: ClamAV is running on a different server. This is a good option for Nextcloud servers with high volumes of file uploads. Executable: ClamAV is running on the same server as Nextcloud, and the clamscan command is started and then stopped with each file upload. 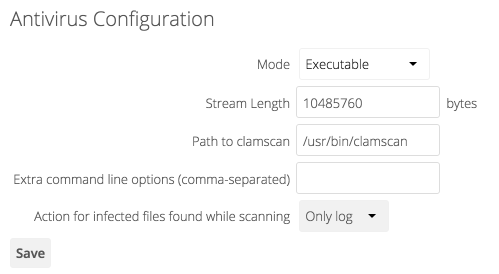 clamscan is slow and not always reliable for on-demand usage; it is better to use one of the daemon modes. The Stream Length value sets the number of bytes read in one pass. 10485760 bytes, or ten megabytes, is the default. This value should be no larger than the PHP memory_limit settings, or physical memory if memory_limit is set to -1 (no limit). Action for infected files found while scanning gives you the choice of logging any alerts without deleting the files, or immediately deleting infected files. For the Daemon option you need the hostname or IP address of the remote server running ClamAV, and the server’s port number. The Executable option requires the path to clamscan, which is the interactive ClamAV scanning command. Nextcloud should find it automatically. When you are satisfied with how ClamAV is operating, you might want to go back and change all of your logging to less verbose levels.